My name is Alyson, and I love movies. At age three, my mom took me to see Bambi in theaters. As a kid, I have fond memories of hiding under blankets in the back of the van so my dad could sneak us kids into the drive-in for free. I saw Psycho at age seven, my brother got his name from Star Wars and my first job was at the local theater. I wouldn’t be who I am today without movies. After many months of fruitless fresh-outta-college job hunting and a need to feel productive again, my husband came up with the idea to start an extensive movie blog. This brainchild came just weeks after watching Julie & Julia and while watching Moulin Rouge! : watch and review every single movie nominated for Best Picture in Oscar history. It was like giving myself my dream-job. Within hours, The Best Picture Project was born. Over the years keeping this blog, I have watched and reviewed nearly every single Best Picture nomination. However, I realized that while these films are great, they skip over hundreds of other amazing films, some memorable classics. So I began reviewing other great films as well, I affectionately call them my Oscar Snubbed collection. I also have a soft spot for animated films and Octobers are dedicated to great and classic horror films. Throughout the project, I have been a guest contributor on MovieFanfare, nominated for the Lammy’s Brainiac Award, and a guest on the Film School Rejects weekly podcast Reject Radio. I am also a member of the 1001 Movies You Must See Before You Die Blog Club and Classic Movie Hub. Each of those honors absolutely floored me. The only realistic hopes I had in the beginning were a few regular readers, besides my mom. These days, my two children come first. In between diapers, school drop-off and dinner, I share my love of film with them. I keep this blog alive and active, especially during Oscar season, thanks to my supportive husband who has become an amazing father. With the confidence of over 700 posts here, my skills are stronger than ever before. It feels great and all I want to do is keep going. Thank you to everyone for making this project a success. I just gave you a blog award. I’m looking forward to more Oscar Snubs, and of course pretty soon there will be more nominees, too. 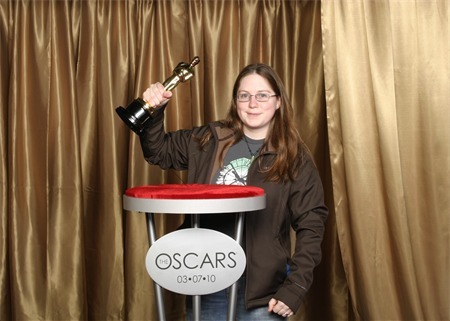 It’s always great to find other people doing an Oscar blog. Your site looks awesome, good luck! I’m going to add you to my Blogroll so folks who visit my site can click a link and visit yours. That’s so nice of you, thanks Mike! Thanks for checking it out Peggy, hope to see you again soon. I was also inspired by Julie & Julia, and recently ended the project – The Aj/Cinephile Project @ ajshawler.blogspot.com. I’ve got to say that going by the comments, Julie & Julia is a classic for ever inspiring so many. I just wanted to take a moment to let you know how much I am enjoying your blog and how much I envy you! I too wanted to sit down and watch every Best Picture nominee I could but had a hard time finding the time to do so. Instead, I settled for buying every Best Picture winner for my own personal collection. I’m still waiting for Cavalcade to hit DVD so I can get rid of the only VHS tape on my Best Picture shelf. lol Also, as a movie fan in general I am enjoying your terrific reviews as well. Keep it up and I’ll keep reading! Each blog has really made me want to go back and try aagain to track down some of these great films! Thansk! Chuck, thank you so much for your kind words. Yes, watching all these movies has been time consuming; as life has progressed, I’ve slowed down from 9 movies a week (insanity!) to 3 or 4. But what a collection you have! My little DVD/bluray collection contains maybe 20 best picture nominees, and one winner: LOTR ROTK. Thanks again for reading! Awesome! I am just starting a Best Picture review blog myself and am trying to find a like-minded community to discuss/compare notes with. Rad! This is great! I started my own Best Picture Blog a couple of months ago. My angle is I watch the films for a given year and comment on what I think should have won/what I like the most/highest rated, etc. It is exciting to see that you have written about nearly every Best Picture nominee so there is hope for me to complete my journey as I’ve only just started with the 4th Awards. It was fun reading through the films I recently watched. If you have any tips for my project, it would be greatly appreciated! Thanks! Thanks Alyson. Pleased to have found your blog with its enthusiasm and knowledge. I’ll return for sure. Regards from Thom at the immortal jukebox (drop a nickel). Thanks for reading, Thom. I’ll be dropping some nickels. Great blog! I started one about watching all the Best Picture nominees several years ago, but wasn’t able to keep up after moving to Australia (TCM was a great way to find some of the harder to find films, and we don’t have it here). Now my husband and I are writing a movie review blog by going through our massive DVD collection in (mostly) alphabetical order.